To commemorate the 25th Anniversary of the Amiga birth AmigaWorld is hosting a special 25th Amiga Anniversary Puzzle competition which is opened to all Amigans. Part 1: The Community section - "Amiga Faces"
The 25th Anniversary picture contains 110 numbered faces of people who, in one way or another have been associated with the Amiga over the past 25 years. Many of the faces will be very familiar [while others will be less so. 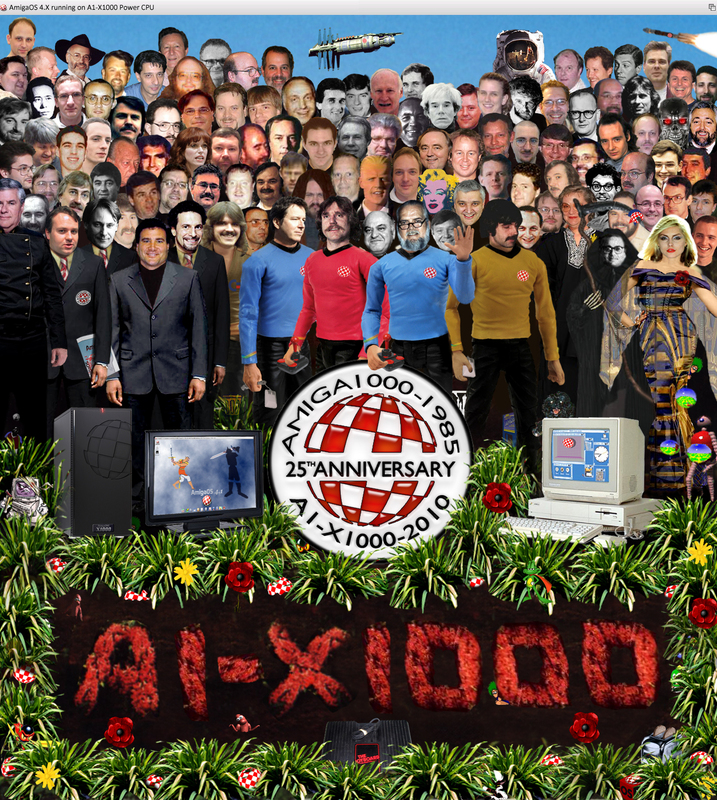 Feel free to collaborate with other community members to identify all 110 "Amiga" faces. 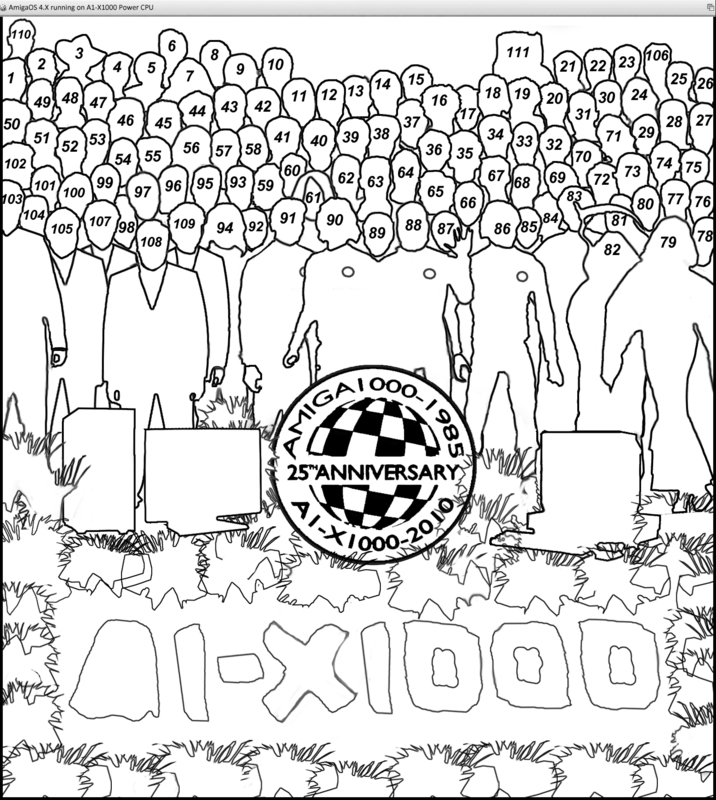 Object: identify all 110 numbered "Amiga faces" that appear in the Puzzle picture. Use the puzzle crib sheet silhouette to find the number for each face. There are at least 30 individual "Amiga" related images in the picture from Amiga games, icons, historical images, logos etc. Object: Identify at least 25 of these images (obviously identifying all 30 images would be better). Part 3: How many Boing Balls are represented in the picture? There are multiple Boing Balls of varying sizes distributed around the picture. Object: Determine the correct number of Boing Balls and circle the correct answer on the sheet. There is an historical "Amigan" inside the spacesuit (111). Object: using the riddle identify the name of the historical Amigan inside the spacesuit. Who, in your opinion, should have been the mystery "Amigan" in the spacesuit. In the event of a tie-break your answer will be used by the "judges" to determine the prize placing. Object: Nominate someone (other than yourself) who in your opinion did most to help the community identify the "Amiga faces" in the Community Section (Part 1) of the Anniversary Puzzle. The person with the most nominations will win the Community prize donated by AmigaKit. PLEASE NOTE: This e-mail address is currently not working correctly, and is expected to be fixed on Tuesday 6th April. Please do not submit anything to it before this date, as it will not be received. Dates of importance and "rules". Last date to enter the competition will be Sunday May 2nd 00:00 CET. All Amigans can enter, including aw.net staff (the aw.net staff do not have the correct answers), with one exception, Tomazkid, since he will see your answers. The winner will be announced around mid May. Special Community Prize - Hyperion-Entertainment Games Pack - donated by Hyperion- Entertainment. The winner will be announced late May. Prize: Amiga Future Mouse mat donated by Amiga Future. The winner will be announced the first week of June. The winner will be announced the second week of June. In mid June all the contestants who have correctly identified at least 100 "Amiga faces" and 25 "Amiga Images" with correct quantity, as well have the correct number of Boing Balls and identified the "Mystery Spaceman" will qualify for the run for the First and Second Prize. The winners of the 1st and 2nd prizes will be chosen from the contestants who have correctly answered all questions. However, if no one has managed this, the winners would be determined by the most right answers in part 1 & part 2 plus the correct answers for both part 3 & part 4. If more than one contestant scores 100% on the quiz, or there is a tie, then the tie-break question will be used to select the 1st and 2nd prize winners. 2nd Prize winner will be announced to coincide with the 25th Amiga Anniversary Event at the Vintage Computer Fair in England. Prize: AmigaOS4 for PPC equipped Classic Amiga's donated by Hyperion-Entertainment. 1st prize winner will be announced announced on July 23rd to coincide with the birth of the Amiga and the Amiga-Event in Essen Germany on the 24th July.